Bootham School – A Lesson in Reduced Energy Cost and Lower Emissions – Adveco Ltd. Founded in 1823, Bootham School is an independent Quaker boarding school located in the city of York. Operating as a charity, this unique and successful school, blends a mix of sensitive grade 2* listed Georgian buildings with new modern construction to create a fully equipped campus for 500 students, of which approximately 140 are boarders. The Quaker value of simplicity, which supports taking good care of the earth and trying to leave the world in a better place after we have left, has driven the school to actively support sustainability and tackle environmental issues relating to its campus. 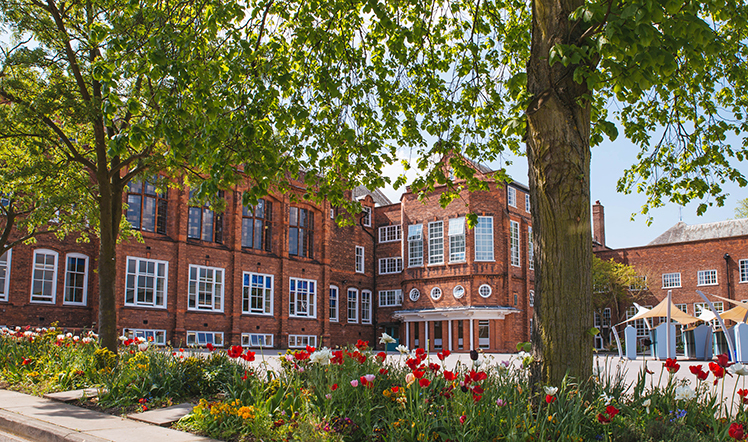 As a boarding school, with residency on campus, a vibrant programme of summer schools and lets, and one of the city’s oldest swimming pool on site, there is a 24/7 near 365 need for hot water produced from the modern boiler house facilities. The school decided to supplement the existing boiler plant with an on-site combined heat and power (CHP) system. 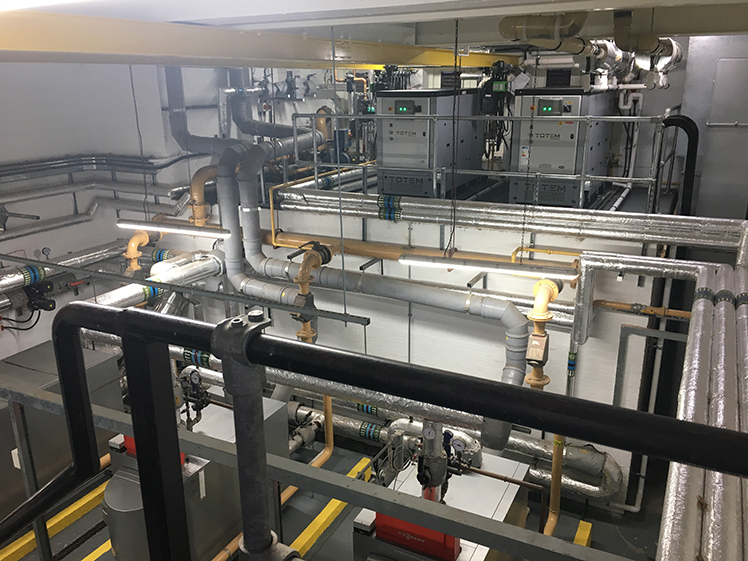 The school worked with Brentwood Consulting Engineers, contractor John Wright Electrical and Mechanical and Adveco, who recommended the installation of two Adveco TOTEM T25 m-CHP units and Adveco MSS5000 for a pre-fed boiler system. Electrical generation by the CHP would decrease the energy import of the school, making operational savings, as well as lowering carbon dioxide emissions. The thermal storage tanks would provide a reservoir of heated water from the CHP to a secondary hot water circuit which then operates constantly through the entire school and boarding houses enabling the drawing off of hot water at any point. Various companies provided predictions during the design stage to prove the feasibility of the project. In modelling Bootham School, Adveco assumed an offset in boiler energy use with an assumed boiler efficiency. Brentwood Consulting Engineers calculated their figures based on the billing data. Both methods are subject to some degree of error, however, each method derived figures in the same order of magnitude. 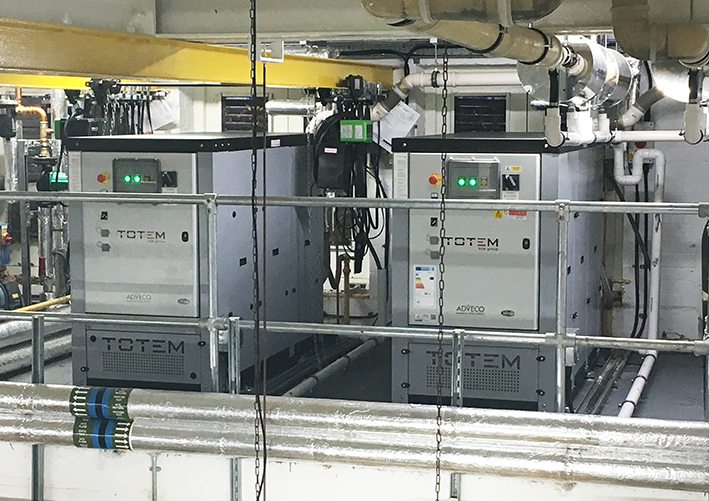 Adveco provided Bootham school with a Full Maintenance Contract, effectively a full term warranty covering all moving parts and controls, that guarantees long-lasting CHP unit efficiency. Key system variables are routinely monitored by a remote system that enables the overall performance of the appliance to be tracked. Any repairs in the duration of the contract will be carried out by Adveco at no additional cost so long as the standard conditions of operation are met. When its efficiency drops below a pre-determined level, a service visit is automatically scheduled to restore efficiency back above that level. With the annual maintenance costs considered, it was possible to work out a cost saving rate per run hour of the CHP unit. That figure could then be applied to the total expected annual run hours of the unit to estimate an annual saving. These predictions would then be assessed against the actual performance to demonstrate that the system is running correctly, whether the payback period will be realised and whether the project could be considered a success. An Adveco Totem m-CHP installation was undertaken, with two 25 kW units providing a 50kW electrical baseload, these units were then commissioned by Adveco and have been running since January 2018. Running data obtained for the first three months was analysed against the pre-contract predictions which shows that the system is running broadly as expected in terms of annual running hours, cost and CO₂ emission savings. Run hours were predicted by Brentwood and Adveco at 7,414 for the year. The pro-rata predicted running hours for the first months of 2018 were 2,091 with the actual running hours being 1,882. This was a positive result for three months running, as CHP installations are generally considered to be viable when they run in excess of 4,500 hours per year. The shortfall of around 200 hours was expected due to the bedding in of the controls strategy, but once optimised the expectation is that the running hours should more closely match the predictions as the installation matures. For the analysed period, the predictions were shown to be close to the actual performance of the system in terms of cost savings (£10,427 versus Adveco’s predicted £10,279) and CO₂ savings (32,573 kg.CO₂ versus a predicted 34,401). The NOx emissions are also greatly reduced. Average UK NOx emissions from the production of electricity that enters the grid is 750 mg/kWh. The NOx emissions from the TOTEM units, in comparison, is less than 40 mg/kWh of electricity output. That does not take into account the heat output from the school’s two appliances. When considered in this way as a waste product, the heat output essentially becomes NOx free. The units are performing better than predicted in terms of cost savings per run hour, and by extrapolating the as-built analysis figures to give a of a full year’s running (6,677 hours) the payback periods for the project will be achieved and Bootham School should save an estimated £36,996, slightly more than Adveco predicted. Importantly, the CHP system also enables the school to adhere to its Quaker values with CO₂ savings of more than 115,500 (kg.CO₂). Adveco Ltd. is the sister company to Adveco (AWP) Ltd., who trade as A.O. Smith Water Heaters in the U.K. and has over 45 years of expertise in the building services industry. With an ethos to offer the very best products, services and support, Adveco prioritises the needs of clients to deliver bespoke, practical solutions.